This post has 973 views. Time for another round-up of my travels and adventures. 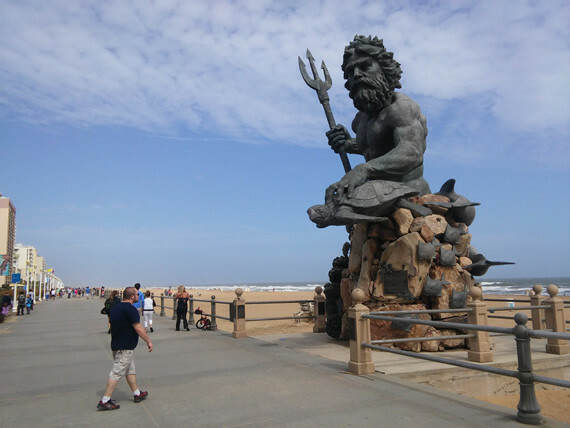 I went on a weekend trip with travel buddies to Virginia Beach, Virginia, to attend the annual Neptune Festival. 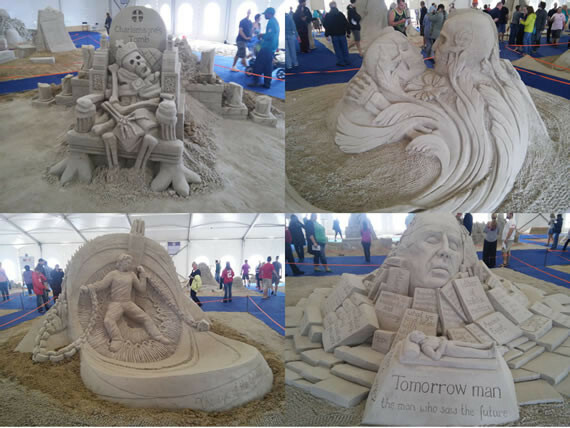 The Neptune Festival is an annual festival that is held on the boardwalk of Virginia Beach, and features food and art, bands, and a sand sculpting competition among other things. I’ve been to festivals/fairs, and I’ve been to beaches, but I’ve never been to a festival at the beach. The trip to VA Beach turned out to be pretty fun, but it would have been even better if the weather cooperated. Rain and high winds in the forecast prompted some drastic changes which forced the cancellation of quite a few activities while the rest moved indoors. The only thing that remained along the boardwalk was the sand sculptures which were housed in a large tent on the beach. We braved the rain and wind to walk to the tent to see the sculptures. There were some pretty fancy designs. It took some real skills to make these sculptures. Despite the bad weather on that day, there were still a good number people visiting the tent to check out the sculptures. Other than the sand sculptures, there was an arts and crafts marketplace that was moved to the VA Beach Convention Center. The festival concerts were also in the convention center. The convention center is a bit of a walk from the beach, but it’s a big and impressive-looking glass building that’s worth a visit. 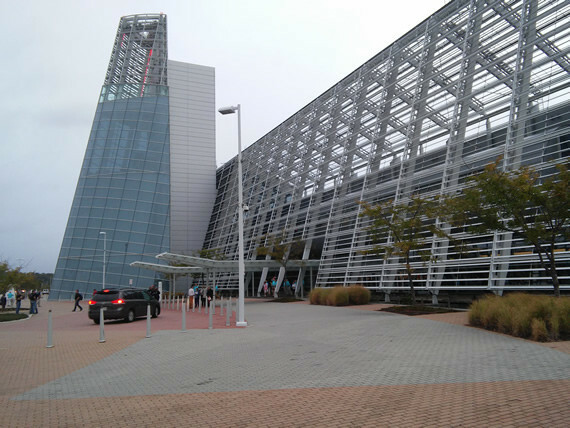 VA Beach has a pretty nice convention center. The weather actually got better as the weekend went on, and on the Sunday there was even some sun and blue skies. 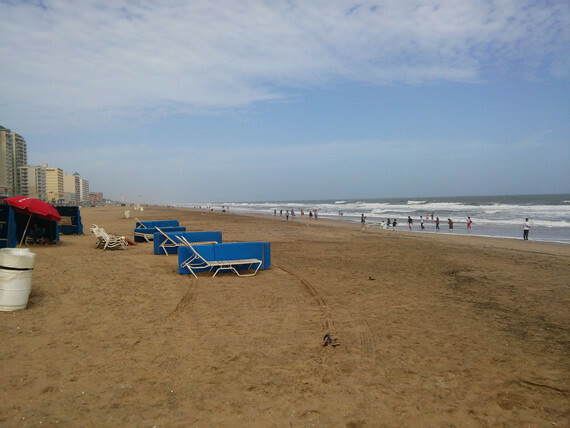 Our group was able to walk around the beach for a bit and I had a good look of the boardwalk and beach area of the city. VA Beach is what I expected from a commercialized beach. All of the real estate next to the beach area is filled with hotels, and then the next one or two streets over are more hotels with shops and restaurants. It’s a decent beach, especially when it’s nice out. Overall, the trip the Virginia Beach didn’t quite go as expected due to inclement weather, but it was still fun because I got to visit a new place and hung out over a weekend with a cool group of people. 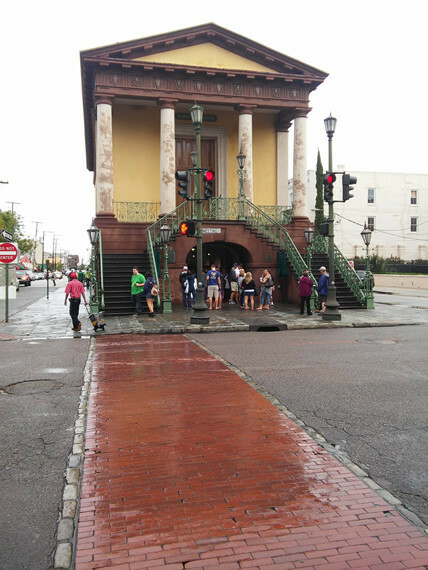 Historical houses… more like mansions along the East Battery. 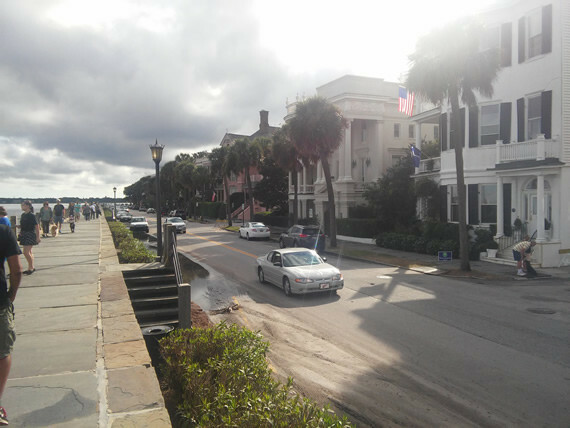 Another weekend trip that I made during the last month was to the city of Charleston, South Carolina. Located on the coast of the state between the Ashley and Cooper Rivers, Charleston has a very rich history as one of the biggest cities in the US from the 17th to 19th centuries. Although technically I’ve been to South Carolina once before when I went to Carowinds, Charleston is the first time I’ve visited a South Carolinian city, and it’s a memorable one at that. The well-preserved historic buildings in the downtown area along with the palmetto trees and lack of tall, modern buildings gives the city a very distinctive vibe. This is what I imagined the Old South would look like. Downtown Charleston is a really great area to walk around in, because it is full of historical architecture, along with many shops and eateries, and bars. We walked up and down King Street where most of the buzz is. The downtown area, especially along King St., is very lively during the weekend, especially on Saturday night when people are out to enjoy the nightlife. My group did a bit of bar hopping too just to participate. Other than King Street, we checked out the historic City Market located on Market Street. The City Market is a long strip of buildings in the center of the street people can buy fun trinkets and crafts. From there, we made our way to the Waterfront Park on the eastern edge, and started walking south. 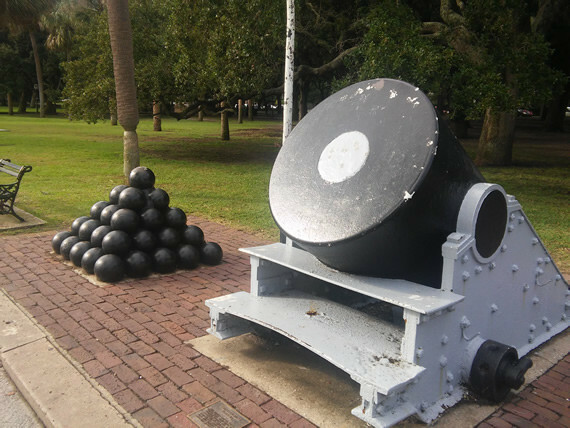 Along the way, we saw a lot of large historic houses along East Battery St, and then had some fun examining the cannons at White Point Garden at the southern end of the city. 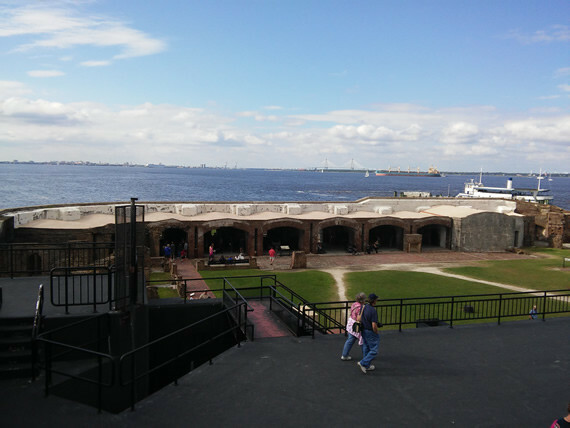 We spent most of our time in the downtown area, but we did visit the Fort Sumter National Monument. A historic sea fort located in Charleston Harbor, Fort Sumter is where the first shots of the American Civil War were fired… at. When South Carolina seceded from the Union, a small number of Union forces occupied the fort and the fort was bombarded by the Confederates. 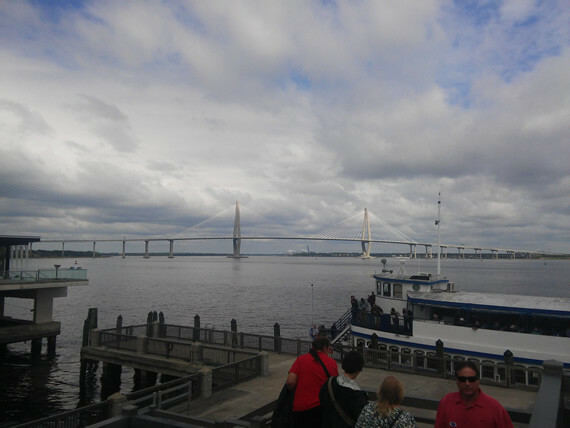 To access the fort, we took the ferry from Liberty Square on the east waterfront of Charleston. A forty minute ride brought us out to the small man-made island where Fort Sumter stands. Only a portion of old brick walls from the Civil War days remains, and there is a newer concrete battery in the middle of the island built for the Spanish-American War. There are still quite a few historic Civil War-era cannons in the fort for people to look at. From Fort Sumter and also during the ferry rides, we got a pretty good look at the Charleston skyline. That was it for my trip to Charleston. I love the historical aspects of the city, and that “southern” vibe that the city gives off. It’s different than the other cities I’ve visited in the southeastern United States so far. We had a good time exploring the downtown area and enjoying the restaurants and bar scene. There are still a lot of places in Charleston we didn’t get the visit this time, but hopefully there will be a next time. It is October, which means autumn has arrived and Halloween is just around the corner. 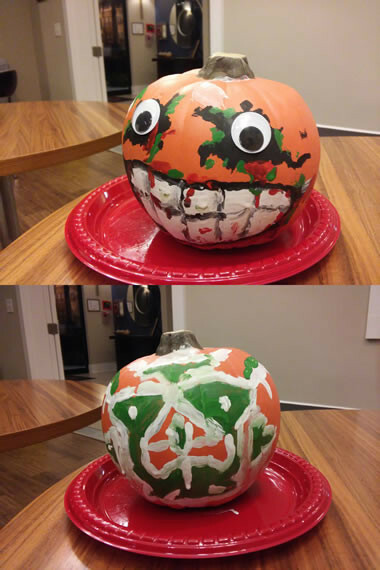 Not too long ago, my apartment complex organized a little get-together where we could paint some (plastic) pumpkins. The activity was probably aimed at kids, but I’ve never painted a pumpkin before, so I signed up too. You can see the results in the above photo. An autumn staple in the Triangle region, the NC State Fair springs to life in the middle of October. There are of course rides, games, farm animals and various other performances, but for a lot of people including myself, the state fair is all about the food. 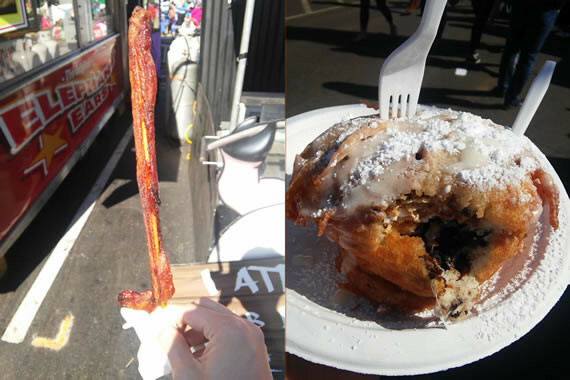 The fair is known for its outrageous fried and bizarre concoctions, and I just couldn’t resist going there for a tasting or two. Below are the photos of the new foods I tried this year and my thoughts on them. 1. Jalapeno and pimento cheese hushpuppies – tasted good, but not really better than other well-prepared hushpuppies I’ve had. 2. Peanut butter chicken wings – More like fried wings in sweet sauce with slight peanut flavor. Merely okay. 3. Lemon wafer ice cream cone – from NC State’s Howling Cow. Deliciously creamy, and three scoops on a cone is quite a bit of ice cream. 1. Fried bacon on a stick – it’s bacon on a stick. Of course it’s good. 2. Fry Me Over the Moon – Moonpie stuffed with 3 Oreos, a Reese’s peanut butter cup, and a Hostess Cupake, fried together and sprinkled with icing sugar and icing. Both awesome and awful at the same time. Couldn’t eat anything else after eating this.